While Barcelona may be Spain's most visited city, there's a lot to be said about Madrid. 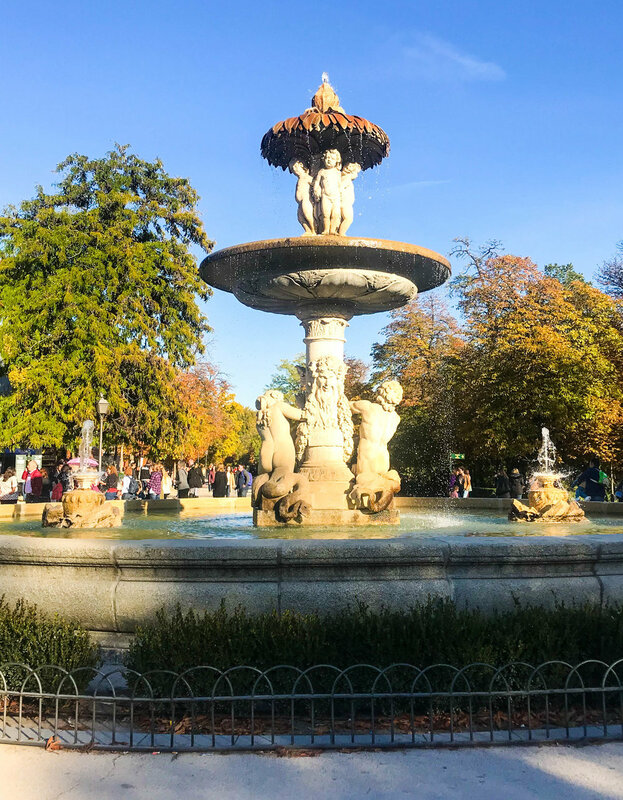 As the capital and largest city, Madrid is known for its beautiful parks, rich culture, and of course, bomb Spanish food. If you're looking for a more local way to explore Spain, this capital city is right up your alley. 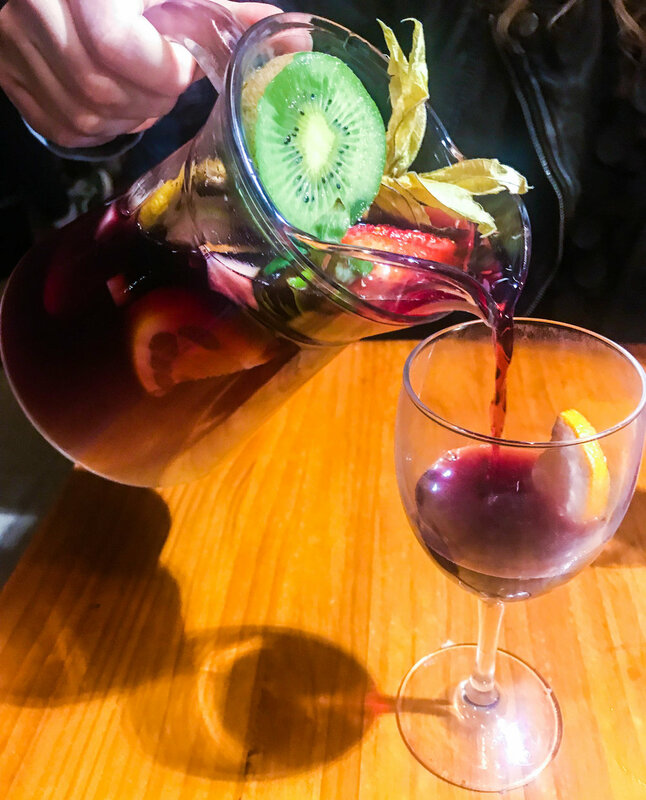 Here's a look at my favorite places to visit, wine, and dine during a weekend in Madrid. I've heard from a few people that the Royal Palace of Madrid is one of the most beautiful palaces in Europe, so naturally I had to check it out. For 10 Euro (11 Euro during peak season), you can visit and explore the palace grounds and tons of extravagantly decorated rooms filled with antiques and royal artifacts. Before you even step foot inside the castle, you'll find sweeping panoramic views of Madrid from right off the courtyard. Make sure to get your photos in now, because photos within the palace are prohibited. You can, however, take photos within the main corridor - which gives you a pretty good idea of what else is in store. Each room has a completely different look and feel -- from rooms covered in silk, to rooms with walls lined with intricate porcelain statues. It's also interesting to see each room's purpose - from where the King gets dressed to where the crown sits. It wouldn't be a trip to Madrid without visiting El Retiro park. Across the grounds are various things to see and do, including a pond where you can rent rowboats, a garden where peacocks walk around and strut their stuff, and the park's most famous attraction: the Crystal Palace. The Crystal Palace is a beautiful glass building situated on a small pond in the middle of the park. When it's sunny, the rays reflect off the walls, creating beautiful rainbow prisms within the building. Unfortunately there wasn't enough sunlight to see many of the prisms when we visited, but it was still beautiful nonetheless. Beyond the Crystal Palace, there are tons of beautiful areas of the park to explore. In Spain, tapas aren't limited to dinner. Hidden in the basement of an adorable boutique, El Invernadero de Salvador Bachiller is probably the cutest brunch place, well, ever. The name translates to Salvador Bachiller's Greenhouse, and definitely lives up to it. When you walk down the stairs, you're greeted with an array of beautiful plants, sweet music, and cozy vibes. You'll think you've died and gone to plant heaven. Until 1pm, 20 Euro will get you a coffee or tea + mimosa or bloody Mary + a two course meal with different brunch options to choose from. They also have a full lunch menu and cocktail list. It's the perfect place to lounge, sip mimosas, and mingle with friends. When it comes to dinner, there are tapas places on almost every corner. Our favorite was Taberna el Sur. They had a good variety of dishes to choose from, which were a lot bigger than we would've anticipated. Of course I can't forget about Spain's most famous dessert... churros! If you thought they were good before, San Gines takes them to the next level. Their 'hot chocolate' which is literally melted chocolate, makes the perfect dipping sauce for their hot, crispy churros. It's no surprise there's a line around the block for these puppies. Pro tip: if you want to avoid the long lines, get your churros to go from their takeaway spot next door and find some steps to sit and enjoy them. 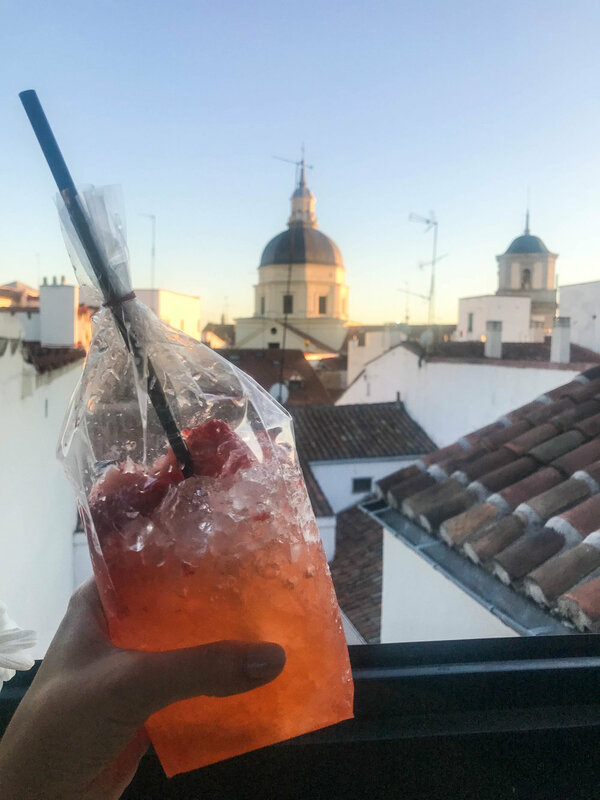 The weather was still pretty beautiful in Spain, so we decided to do some recon on the best rooftop bars. After stuffing our faces with churros, we stumbled upon The Hat hostel and restaurant. This place has a total hipster vibe, complete with cocktails in mason jars and clear throwaway bags. The menu was completely in Spanish so I'm not *totally* sure what was in my drink - but it was delicious nonetheless. If you're looking for a rooftop bar with a more swanky vibe, try the Roof at the Reina Victoria hotel. It's more of a 'see and be seen' cocktail bar with beautiful people and delicious drinks. Plus, the decor is on point. The Roof bar has a huge inside area as well as a large patio, so you don't have to pass on this place when the weather is cold.